[map] [street view] Southeast of Tuscsaloosa on Hargrove Road. Several miles east of US-80. AUX: 10 kW @ 450 feet. 60 dBu protected contour map, from the FCC. Covers all of west Alabama thoroughly, including most of the western parts of the Birmingham metro. Gets spotty from about downtown on east. Also puts a decent signal into the Columbus, MS area. [Picture] RDS display from an Insignia radio in northwest Alabama, showing the Radio Text and PI fields, from June 2017. The University of Alabama's first radio station debuted on 91.7 MHz in 1949, as WUOA, with a light music and public radio format. From the beginning, the studios were located in Bryce Hall (Formerly the old Union Building) at the corner of Colonial Drive and University Boulevard on campus. At the start, the station ran 15 kW from a tower behind the building that was about 120 feet tall. By the mid-60's the station struggled to get funding and was off the air. The station was gone and license deleted by 1970. In 1971 the Board of Trustees filed an application to bring the station back to life, as a little 10 watt station, still on 91.7 MHz. Because the original calls were taken by a commercial station in town, they had to pick a new call sign and chose WUAL. When the station signed on in September 1972, the station catered to the college kids' music preferences and was listed as a Progressive Rock outlet. The station sought to upgrade its coverage area in the late 70's and originally planned to run 100 kW from a site near the intersection of US-11 and AL-215, but that proposal was dropped for a site near Duncanville, south of the city limits, with a taller tower. That new facility signed on in 1981, utilizing a 10-bay Harris antenna, and implementing a 67 kHz SCA (Subsidiary Communications Authority) feed. Around the time the new signal signed on, the format switched from college-oriented to a full service public radio format. The college format was kicked over to the University's new lower powered student-run station, WVUA. The station became an early adopter of the HD digital hybrid broadcasting system via an experimental permit in 2005, and eventually began carrying the Xponential Radio Adult Album Alternative format, until it ended national distribution. Today, The University programs its own AAA-formatted music format called APR Rocks. For a time in 2016, the station was being heard on a translator in Demopolis as filler until the translator picked up a more permanent parent station. The University put on a new translator in Tuscaloosa in December 2016 on 92.5 MHz. That translator began relaying the main WUAL programming channel but is listed as relaying a future HD4 subchannel, whose programming has yet to be revealed. The HD system went offline for replacement in February 2018, and came back on in August 2018, using a combined FM+HD antenna system, instead of the old system which had separate antennas for each broadcast. 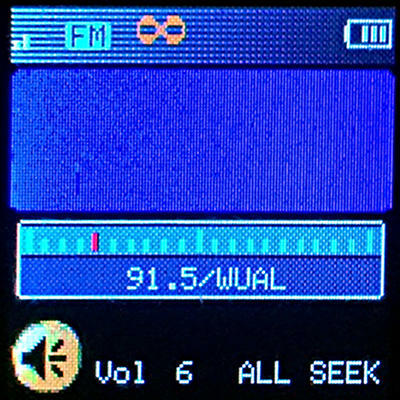 After the system was turned back on, the HD2 channel began carrying the "eXpoNential Radio" Adult Album Alternative format from WXPN in Philadelphia. It also began carrying game day announcements for people visiting the University for football games.